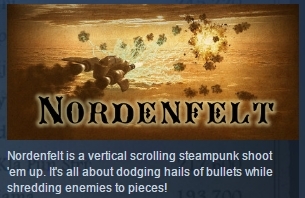 Nordenfelt is a steampunk shoot ´em up game for Windows. It´s your turn now to shoot your way through masses of obscure vehicles while dodging hails of bullets. Unlock powerful equipment and send those intruders back to hell even faster. ★ good old-school vertical scrolling shooter fun!